Welcome to this week’s party! Real quick, I’ll give ya’ll a couple features and then we’ll get right along to the party! Last week was a great party, there were soo many cool things. I hope you checked them out. I had to give Joy at Momma’s Kinda Crafty a shout out for her link up to Momma’s Tool Box. Every momma woman needs one of these. My life would be soo much easier right now if I didn’t have to go hunting for a tool every time I need one. 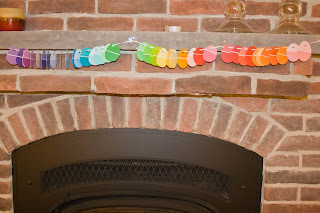 Becky at Rub Some Dirt on It shared this ca-ute Easter garland. She tells it as a “how not to” tutorial, but I think it turned out just adorable. Perfection is over-rated anyway. This has some personality to it. Thanks for sharing, ladies! Grab a featured button from the side bar. And THANKS to everyone who linked up! On with the party! There are no rules, except to keep it family friendly. I’d love for you to link back or grab a button though. Help get your projects out there. I’d also love for you to follow, but you don’t have to. Please no commercial sites. And please visit each other. By linking, you are granting permission for me to use a photo in a feature with credit and a link back to you. Let’s Party! Hi…I linked up to your festive party again this week. Thanks for hosting.